Dr. Klima is a Board Certified Orthodontist, also known as a Diplomate of the American Board of Orthodontics. Click on the logos below to take you to the American Board of Orthodontics website. 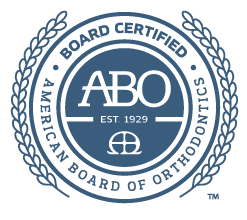 To become board certified, an orthodontist has to pass a rigorous set of written and clinical examinations, as well as a comprehensive review of their credentials. The initial process of becoming board certified can take anywhere from five to ten years. Once certified, the orthodontist must become recertified every ten years to maintain board certified status.